The bearing capacity of a steel structure is substantially reduced due to temperature rise that fire causes. ISOVER FireProtect is a simple and reliable system that limits the temperature rise in the steel. The ISOVER FireProtect system provides highly efficient fire protection for structural steel. It has few parts and is assembled without complicated, expensive installation tools. The system works equally well for the supporting columns or supporting beams of steel. ISOVER FireProtect can be used for fire protection of structural steel with fire resistance from R 30 up to R 240. ISOVER FireProtect is tested according to ENV 13381-4 and approved by SP Fire Research AS (Product documentation SPFR 010-0202). In the design of a steel structure, consideration must be given to how the steel would be affected under the influence of fire, causing the tension in the steel to decrease with increasing temperature. ISOVER FireProtect is a very efficient system for limiting temperature rise of the supporting steel structure, thus prolonging its fire resistance. Coarse structures have the best fire resistance. How quickly a steel structure is heated in a given fire is measured by the ratio of profile steel fire exposed surfaces and profile heat capacity. This relationship is expressed through the so-called section factor, Ai/Vs. 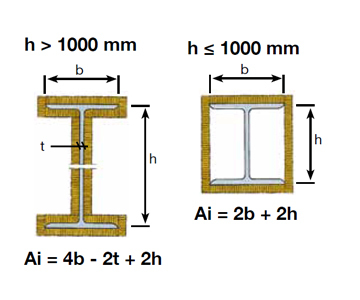 Ai is the internal perimeter of the insulation in meters, Vs is the steel cross-sectional area in m². Examples of profiles with a low section factor (Ai/Vs) are HEB and HEM. High section factor Ai/Vs means quick heating of the steel. This means that slender structural steel requires thicker fire insulation. The fire resistance of a steel structure is calculated on the basis of the critical steel temperature. 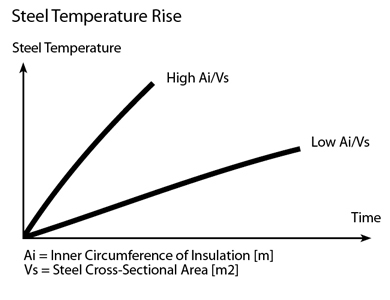 Calculation of the critical steel temperature is based on steel cross-section load ratio. Normally, you can calculate the required insulation thickness at the critical steel temperature of 500 °C. You can check with the designer for that project on the critical steel temperature for the different structures and find out if it is higher compared to the amount of steel used in a normal situation. A higher critical steel temperature of the steel will require thinner insulation thickness. More information can be found in EN 1993-1-2: Eurocode 3: Design of steel structures – Part 1-2: General rules - Structural fire design. ISOVER FireProtect is approved also for fire insulation of HSQ-profiles (hat profiles). First decide the profile type and size, then find the section ratio Ai/Vs using profile data from the steel supplier. Or one can find the most common profiles in the program's database. The program will then calculate the required insulation thickness based on selected critical steel temperature. The calculations are according to ENV 13381-4: 2007. ISOVER FireProtect Screw is designed specifically for this type of fire insulation. The single screw and a battery-powered screwdriver are all needed for making a quick, cost effective and accurate mounting. The screws are available in different lengths. The screw must be at least twice as long as the insulation thickness. Other fastening methods may be used such fixing by the welding pins. This solution has to be used when fixing to surfaces with a width > 300 mm and other places where it is not possible to fix FireProtect by screwing the boards together. Cut the ISOVER FireProtect boards to 2-3 mm oversize and put them into the steel profiles. Fix the boards at pin spacings with d ≤ 300 mm. About 10 pieces/m² are needed. Pins must have a minimum diameter of 2.8 mm and the washer must be no less than 30 mm wide. Maximum distance from the cladding's edges is 75 mm.